The faculty of law, Jamia Millia University conducts a Law entrance exam annually for admission into its BA.LLB program. The complete application procedure is online. Candidates who want to apply for BA LLB Law Entrance Exam must fill the application form online. The total number of seats is 120. Out of these 120 seats, there are 60 seats which are self-financed. The difference between this two category of seats is that the fee for self-financed seats is a lot more.Here, we are discussing the complete details of the syllabus of BA LLB Entrance Exam 2018. One is eligible to apply for Jamia Millia Islamia BA.LLB 2018 course if he/she has obtained a minimum of 50% marks in 10+2 or equivalent exam counting all the core subjects and English language put together. The eligibility for general category students in terms of age is that one should not be more than 20 years of age and this eligibility for SC and ST students is that they should not be more than 22 years. This age is calculated as on July1 of the year in which admission is being sought. Now let us quickly read the exam pattern and syllabus for the JMI BA LLB entrance exam. The exam will be conducted offline i.e pen paper mode. There is negative marking in the Law Entrance Exam and while each question which you answer correctly gets you +1 mark but every wrong answer means -.50 marks. The exam has only objective type questions and the exam duration is 2 hours. English Section For Law Entrance Exam: In this section, one passage will be given and the entrant has to answer questions based on the understanding of the passage. There will be jumbled sentences kind of questions where one has to rearrange the given parts to form a meaningful sentence or paragraph. English grammar is equally important plus one has to improve their vocabulary for word meaning questions. The syllabus for GK is huge and one must know about Indian judiciary, banking and finance, business, important Indian institutes, defense and space-related news, news related to science and technology, economics, geography, international relations, movies, major awards and honors, the who's who in India and the world, Constitution, sports, Indian agriculture and Indian industries. The topics covered in this section are family law, a law of torts, law of contracts and criminal law. Family law covers majorly Hindu and Muslim laws. Law of contracts covers essential elements of contracts, types of contracts, what happens when the contract is breached, how are the performance of contracts done and everything it entails, then comes discharge of contracts and finally specific kinds of contracts. Torts cover general defenses, vicarious liability of an individual and the government, remoteness of damage, and finally offences and their definitions and details for example nuisance. The criminal law means IPC so the general principles of IPC, stages of crimes and offences, right of private defense of body and property. This covers data interpretation and data sufficiency questions plus this covers basic arithmetic based Mathematics topics such as percentage, compound interest, profit loss, time and speed and distance, relative speed, averages, age, pipes and cisterns kind of questions, ratio-proportion, allegation and mixture, questions on circular track as well as upstream-downstream kind of questions, and last of all partnership based questions. Then there are algebra based questions on topics such as properties of circles, areas and volumes of 2 dimensional and 3 dimensional figures, questions on the BODMAS rule, linear equations, quadratic equations, number system and probability, LCM and HCF, height and distance, logarithm, indices, arithmetic and geometric progression, set theory and Venn diagram, geometry and mensuration, properties of quadrilaterals and finally properties of triangles. This includes critical reasoning and analytical reasoning. Analytical Reasoning which covers series completion, odd one out, blood relation questions and clock and calendar questions, cubes based questions, matrix-based questions, coding and decoding, direction and distance tests, and seating arrangement based logical questions. Last of all comes verbal reasoning which includes strong and weak arguments, statements and assumptions, statement and conclusion and statement and inferences based questions, causes and effects, syllogism, logical deductions based on syllogism, odd one out, analogies, and logical sequence of words. This is the syllabus for Jamia Millia Islamia BA.LLB entrance exam. Now let us look at the weightage given to each section in terms of marks. Hopefully, this information gives you a direction for your Jamia Millia Islamia BA.LLB entrance exam preparation. 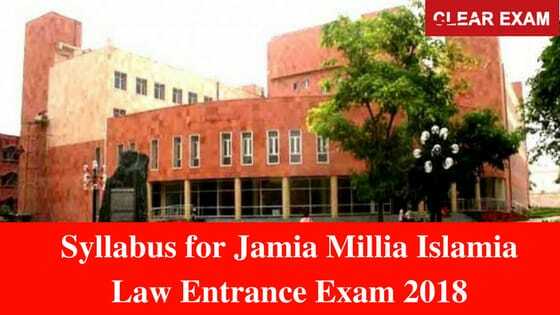 Check here the complete Syllabus for Jamia Millia University Law entrance exam 2018 and get more details about admission into its BA.LLB program.